While still unannounced, sources who have seen the game in action tell Kotaku that the next Call of Duty will be a Modern Warfare 3 that pushes the bar on what people have come to expect from the series. And it hits later this year. The yet-to-be announced sequel is under development by Infinity Ward, though a swath of those developers left the company in a civil-litigation uprising last year. The team is being assisted by another team, perhaps the newly minted Activision studio Sledgehammer Games, we're told. The Call of Duty series has long alternated between two sets of stories and timelines. The games made by Treyarch have typically been set during the events of World War II, though last year's Call of Duty: Black Ops moved the setting to the Cold War of the 1960s. Starting with 2007's Modern Warfare, Infinity Ward's Call of Duties all took place in a modern day setting. In the original Modern Warfare, a civil war breaks out in the Russia of 2011. The story continues in Modern Warfare 2, which has a terrorist attack in Russia erroneously linked to the United States. That leads Russian forces to invade the US. Some of the missions even feature rolling ground combat in the Washington, D.C. suburbs of Virginia and in the capital itself. 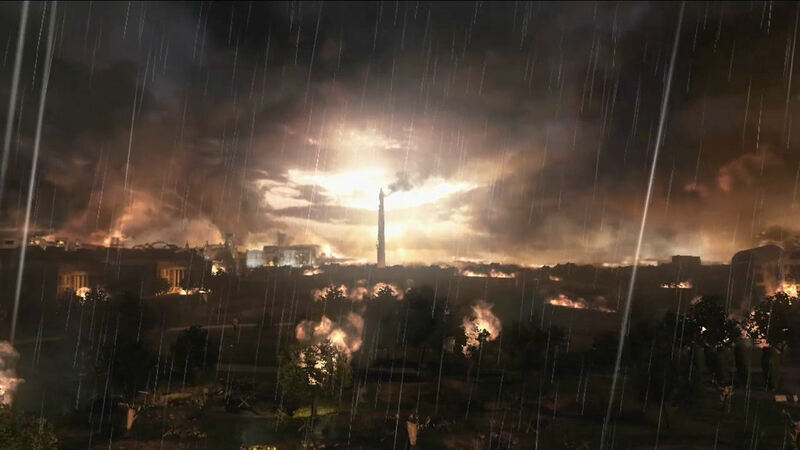 Key to the near ending of Modern Warfare 2, was the detonation of a nuclear missile in the upper atmosphere above the Mid-Atlantic, something that creates an electromagnetic pulse that destroyed all electronic equipment on both sides of the raging war in DC. Such an event would cripple the area in the short term, essentially removing the ability to use most technology in the region as the country tries to rebuild or bring in support from other parts of the country. It also seems that it could make the story a hard one to follow in a modern day shooter. But our sources tell us Modern Warfare 3 will continue along that storyline, delivering a "world in crisis" feel to the aftermath of the US invasion. However, it looks like it won't be another take on Red Dawn, a post-US invasion storyline already explored by Homefront. While it's unclear where specifically the game will be set, Modern Warfare 3 will have a urban setting, much like the US missions in Modern Warfare 2, with military vehicles, including tanks, rolling through suburban streets. The story may also include prominent characters from Modern Warfare 2, like Captain John "Soap" MacTavish and Captain John Price. Modern Warfare 2 ended with Price, Soap and a Russian informant codenamed Nikolai on the run as international fugitives following their killing of Lieutenant General Shepherd. The biggest shift for the game appears to be in its breadth. We're told that Modern Warfare 3 will take place on a much larger, epic scale. It appears the game will explore the lead up to a blossoming set of engagements that could pull in other countries, creating a potential World War III scenario. The game will also feature large, urban destructible environments. The focus on larger maps and destructible environments brings to mind competitor Electronic Arts' Battlefield series which made a name for itself with those two keystones. Battlefield 3 is also set for a 2011 fall release, meaning the two games could in theory be vying directly with one another for gamers' attention. Battlefield 3, as shown by EA in previous events this year, will take place in a modern setting and feature large maps and destructible environments. We expect to hear more about the Call of Duty series and Modern Warfare 3 this (northern) summer during the annual E3 trade show. We've contacted Activision for comment on this story and will update when we hear back. "It appears the game will explore the lead up to a blossoming set of engagements that could pull in other countries, creating a potential World War III scenario." Do we really care about this? I mean Modern Warfare 2 had Russia invade the US and a nuclear missile detonated on it's border, but the plot was still terrible and had me not caring about it or the players I was playing. Why would this make things better? I would be more impressed if the news article was just "Modern Warfare 3 To Feature Story"
I loved the story. If I wanted something more plausible I would have watched a documentary. Activision are gunna have to pull a miracle here if they want my money. BF3 has my loyalty thus far. It's not going to be fully destructible like Battlefield. Call of Duty's current engine just can't support it. For crying out loud it's just a revision of the Quake III engine! Just hope it doesn't have unlimited spawning enemies. That made me hate the original, MW2 was so much better without it. Hahahahaha, I can't wait until they start talking up destructible environments more and then the game will come out and it won't even be near the level of Bad Company 1 let alone Bad company 2 or Battlefield 3. They have no experience in it whatsoever and their engine is not built for it. I can't wait until Battlefield stomps CoD and it gasps for it's last breath of air.. Why? Because I'm a a fanboy? No, because CoD has been turned into the most pathetic excuse for a "Video game" in the history of this solar system. I want it to die a horrible death. Still better than Cooking Mama. Sorry Modern Warfare, I got suckered into buying the first two due to hype. Both times I regretted it when I discovered your shitness. That said, I'm actually kind of glad that this is coming out. MW can keep the 12yos playing in their corner and the more mature gamers can enjoy BF3 in peace. If I play BF3 for even half the time I spent playing BF2 then it will be money well spent.